What happens on the last day of a massive star’s life? In the hours before the star collapses and explodes as a supernova, the rapid evolution of material in its core creates swarms of neutrinos. Observing these neutrinos may help us understand the final stages of a massive star’s life — but they’ve never been detected. The nuclear fusion that powers stars generates tremendous amounts of energy. Much of this energy is emitted as photons, but a curious and elusive particle — the neutrino — carries away most of the energy in the late stages of stellar evolution. Stellar neutrinos can be created through two processes: thermal processes and beta processes. 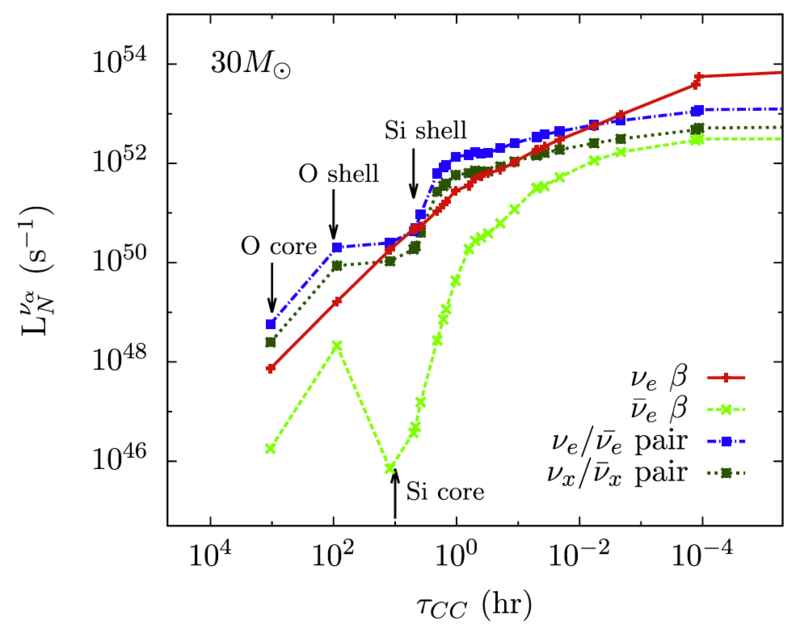 Thermal processes — e.g., pair production, in which a particle/antiparticle pair are created — depend on the temperature and pressure of the stellar core. Beta processes — i.e., when a proton converts to a neutron, or vice versa — are instead linked to the isotopic makeup of the star’s core. This means that, if we can observe them, beta-process neutrinos may be able to tell us about the last steps of stellar nucleosynthesis in a dying star. 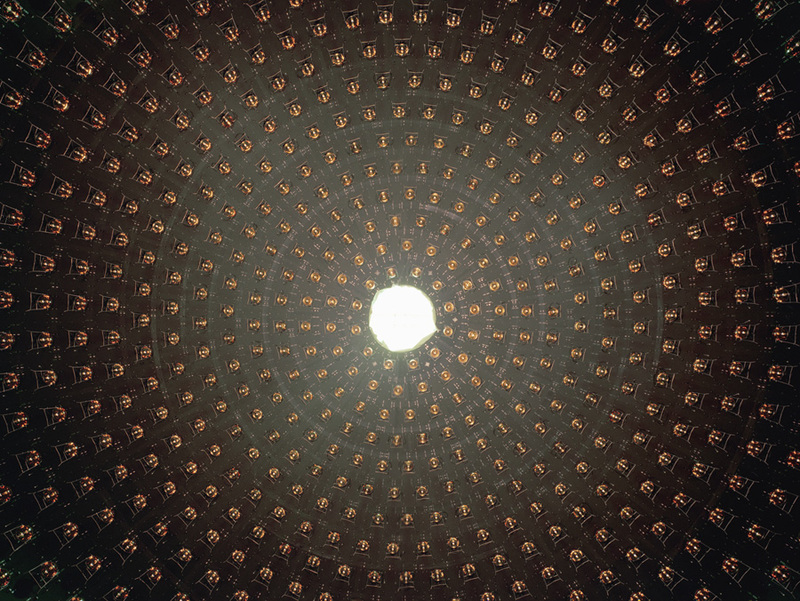 But observing these neutrinos is not so easily done. Neutrinos are nearly massless, neutral particles that interact only feebly with matter; out of the whopping ~1060 neutrinos released in a supernova explosion, even the most sensitive detectors only record the passage of just a few. Do we have a chance of detecting the beta-process neutrinos that are released in the final few hours of a star’s life, before the collapse? To answer this question, Kelly Patton (University of Washington) and collaborators first used a stellar evolution model to explore neutrino production in massive stars. 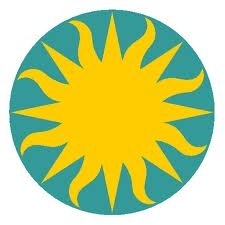 They modeled the evolution of two massive stars — 15 and 30 times the mass of our Sun — from the onset of nuclear fusion to the moment of collapse. The authors found that in the last few hours before collapse, during which the material in the stars’ cores is rapidly upcycled into heavier elements, the flux from beta-process neutrinos rivals that of thermal neutrinos and even exceeds it at high energies. So now we know there are many beta-process neutrinos — but can we spot them? For an imminent supernova at a distance of 1 kiloparsec, the authors find that the presupernova electron neutrino flux rises above the background noise from the Sun, nuclear reactors, and radioactive decay within the Earth in the final two hours before collapse. 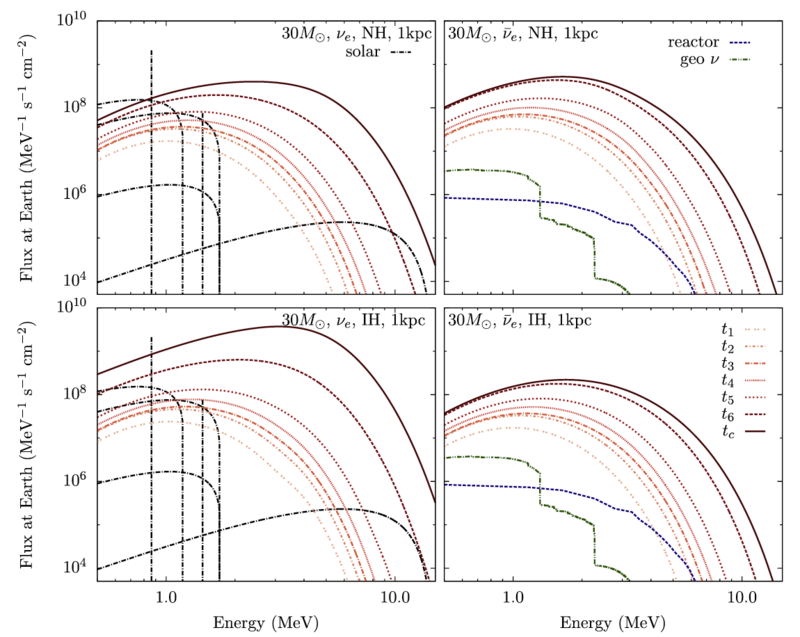 Based on these calculations, current and future neutrino observatories should be able to detect tens of neutrinos from a supernova within 1 kiloparsec, about 30% of which would be beta-process neutrinos. As the distance to the star increases, the time and energy window within which neutrinos can be observed gradually narrows, until it closes for stars at a distance of about 30 kiloparsecs. Are there any nearby supergiants soon to go supernova so these predictions can be tested? At a distance of only 650 light-years, the red supergiant star Betelgeuse should produce detectable neutrinos when it explodes — an exciting opportunity for astronomers in the far future! Tonight, look for ruddy-hued Betelgeuse, one of the sky’s most famous stars. Kids especially like Betelgeuse, because its name sounds so much like beetle juice. The movie by that same name perpetuated this pronunciation. But astronomers pronounce it differently. We say BET-el-jews. People have described this star as somber or sometimes even grandfatherly. That may be because of Betelgeuse’s ruddy complexion, which, as a matter of fact, indicates that this star is well into the autumn of its years. Betelgeuse is no ordinary red star. It’s a magnificently rare red supergiant. 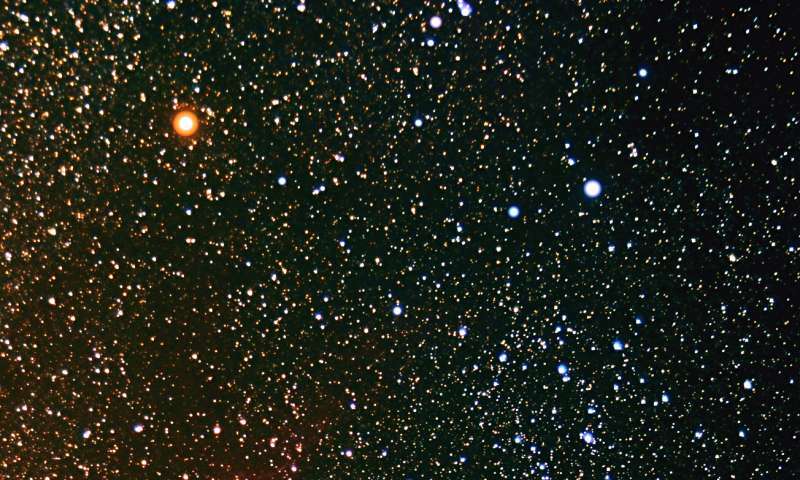 According to Professor Jim Kaler – whose website Stars you should check out – there might be only one red supergiant star like Betelgeuse for every million or so stars in our Milky Way galaxy. At this time of year, Betelgeuse’s constellation – Orion the Hunter – ascends to its highest point in the heavens around 8 to 9 p.m. local time – that’s the time on your clock no matter where you are on the globe – with the Hunter symbolically reaching the height of his powers. As night passes – with Earth turning eastward under the stars – Orion has his inevitable fall, shifting lower in the sky by late evening. Orion slowly heads westward throughout the late evening hours and plunges beneath the western horizon in the wee hours after midnight. Bottom line: The ruddy star Betelgeuse depicts Orion’s shoulder. 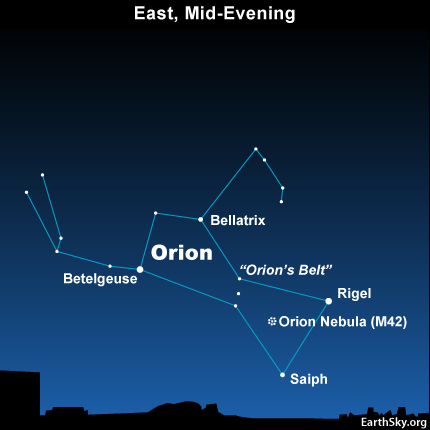 In mid-February, Orion reaches his high point for the night around 8 to 9 p.m. local time. Every star will someday run out of fuel in its core, bringing an end to its run as natural source of nuclear fusion in the Universe. While stars like our Sun will fuse hydrogen into helium and then — swelling into a red giant — helium into carbon, there are other, more massive stars which can achieve hot enough temperatures to further fuse carbon into even heavier elements. Under those intense conditions, the star will swell into a red supergiant, destined for an eventual supernova after around 100,000 years or so. And the brightest red supergiant in our entire night sky? That’s Betelgeuse, which could go supernova at any time. The color-magnitude diagram of notable stars. The brightest red supergiant, Betelgeuse, is shown at the upper right. European Southern Observatory. Honestly, at its distance of 640 light years from us, it could have gone supernova at any time from the 14th century onwards, and we still wouldn’t know. Betelgeuse is one of the ten brightest stars in the sky in visible light, but only 13% of its energy output is detectable to human eyes. If we could see the entire electromagnetic spectrum — including into the infrared — Betelgeuse would, from our perspective, outshine every other star in the Universe except our Sun. Three of the major stars in Orion — Betelgeuse, Meissa and Bellatrix — as revealed in the infrared. In IR light, Betelgeuse (lower left) is the brightest star in the night sky. 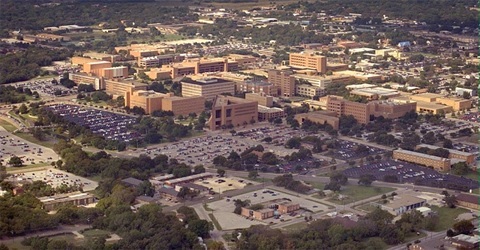 NASA / WISE. It was the first star ever to be resolved as more than a point source. At 900 times the size of our Sun, it would engulf Mercury, Venus, Earth, Mars and even the asteroid belt if it were to replace our parent star. 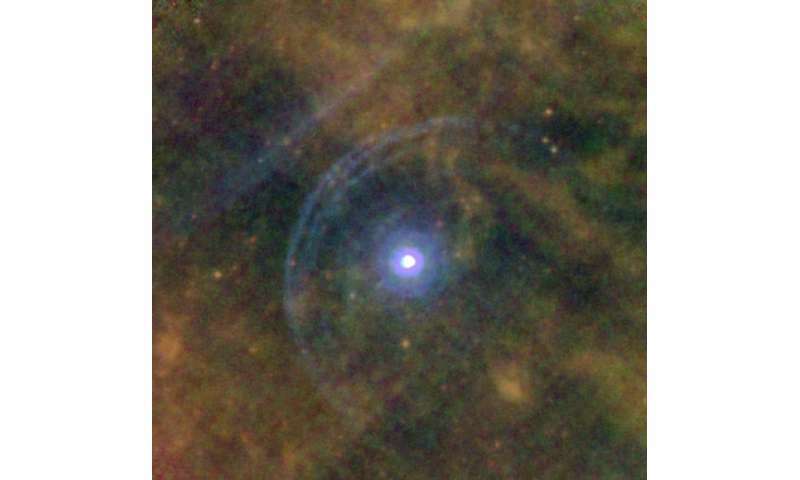 It’s a pulsating star, so its diameter changes with time. In addition, it’s constantly losing mass, as the intense fusion reactions begin to expel the outermost, tenuously-held layers. Direct radio observations can actually detect this blown-off matter, and have found that it extends to beyond the equivalent of Neptune’s orbit. But when we study the night sky, we’re studying the past. We know that Betelgeuse, with an uncertain mass between about 12 and 20 times that of our Sun, was never destined to live very long: maybe around 10 million years only. 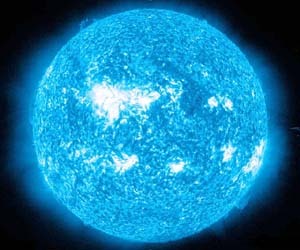 The more massive a star is, the faster it burns through its fuel, and Betelgeuse is burning so very, very brightly: at around 100,000 times the luminosity of our Sun. It’s currently in the final stages of its life — as a red supergiant — meaning that when the innermost core begins fusing silicon and sulphur into iron, nickel and cobalt, the star itself will only have minutes left. The anatomy of a very massive star throughout its life, culminating in a Type II Supernova. Nicole Rager Fuller for the NSF. At those final moments, the core will be incredibly hot, yet iron, nickel and cobalt will be unable to fuse into anything heavier. It’s energetically unfavorable to do so, and so no new radiation will be produced in the innermost regions. Yet gravitation is still at play, trying to pull the star’s core in on itself. Without nuclear fusion to hold it up, the core has no other options, and begins to implode. The contraction causes it to heat up, become denser, and achieve pressures like it’s never seen before. And once a critical junction has passed, it happens: the atomic nuclei in the star’s core begin a runaway fusion reaction all at once. This is what creates a Type II supernova: the core-collapse of an ultra-massive star. After a brief, initial flash, Betelgeuse will brighten tremendously over a period of weeks, rising to a maximum brightness that, intrinsically, will be billions of times as bright as the Sun. It will remain at maximum brightness for months, as radioactive cobalt and expanding gases cause a continuous bright emission of light. Supernovae have occurred in our Milky Way in the past: in 1604, 1572, 1054 and 1006, among others, with a number of them being so bright that they were visible during the day. But none of them were as close at Betelgeuse. At only 600-or-so light years distant, Betelgeuse will be far closer than any supernova ever recorded by humanity. It’s fortunately still far away enough that it poses no danger to us. Our planet’s magnetic field will easily deflect any energetic particles that happen to come our way, and it’s distant enough that the high-energy radiation reaching us will be so low-density that it will have less of an impact on you than the banana you had at breakfast. But oh, will it ever appear bright. Not only will Betelgeuse be visible during the day, but it will rival the Moon for the second-brightest object in the sky. 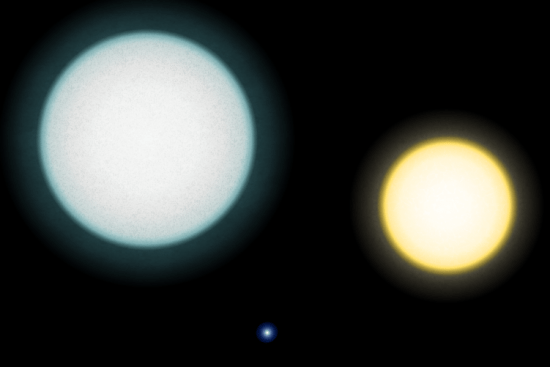 Some models “only” have Betelgeuse getting as bright as a thick crescent moon, while others will see it rival the entire full moon. It will conceivably be the brightest object in the night sky for more than a year, until it finally fades away to a dimmer state. Unfortunately, the key question of “when” is not one we have an answer to; thousands of other stars in the Milky Way may go supernova before Betelgeuse does. Until we develop an ultra-powerful neutrino telescope to measure the energy spectrum of neutrinos being generated by (and hence, which elements are being fused inside) a star like Betelgeuse, hundreds of light years away, we won’t know how close it is to going supernova. It could have exploded already, with the light from the cataclysm already on its way towards us… or it could remain no different than it appears today for another hundred thousand years. 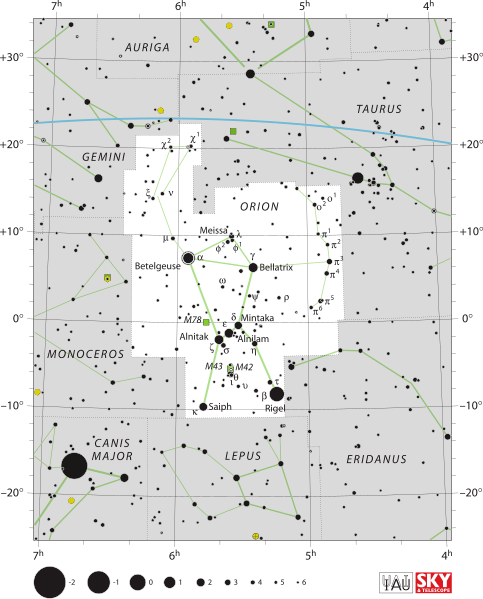 Tonight … look for Orion the Hunter, one of the easiest constellations to identify in the night sky. Many constellations have a single bright star, but the majestic constellation Orion can boast of two: Rigel and Betelgeuse. You can’t miss these two brilliant beauties if you look eastward around 7:30 to 8:30 p.m. (your local time). Rigel and Betelgeuse reside on opposite sides of Orion’s Belt – three medium-bright stars in a short, straight row. The star Rigel depicts Orion’s left foot. A blue-white supergiant and one of the most luminous stars known, it’s nearly 800 light-years away. If Rigel were as close as Sirius, the brightest star visible to the eye (and only about 8.6 light-years away), Rigel would shine much more brilliantly than Venus, our sky’s brightest planet. Betelgeuse – the other bright star in Orion – represents the Hunter’s right shoulder. A red supergiant, Betelgeuse is no slouch of a star either. In fact, if Betelgeuse replaced the sun in our solar system, its outer layers would extend past Earth and Mars and to nearly the orbit of Jupiter. On a dark night, when the moon has dropped out of the evening sky in the second half of December 2016, you might want to look at the magnificent Orion Nebula, or M42, the fuzzy patch in Orion’s Sword. 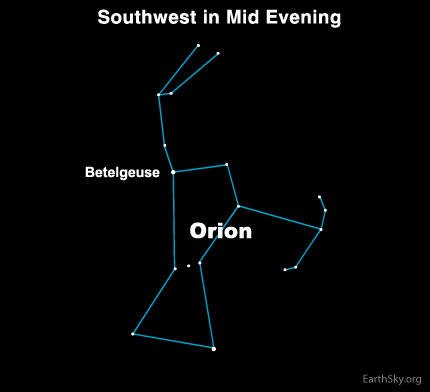 Bottom line: Many constellations have a bright star, but Orion has two: Rigel and Betelgeuse. 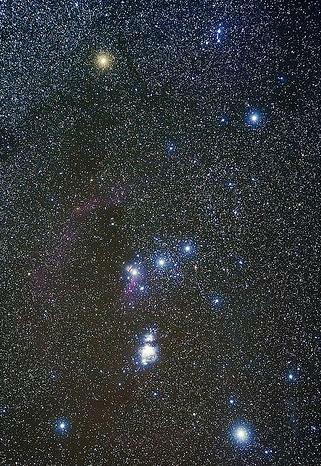 You’ll also easily recognize Orion by its “Belt” stars, three medium-bright stars in a short, straight row. From Daily Galaxy- “Image of the Day: Is the Milky Way’s Red Giant Betelgeuse the Next Nearby Supernova? While there is, on average, only one supernova per galaxy per century, there is something on the order of 100 billion galaxies in the observable Universe. Taking 10 billion years for the age of the Universe (it’s actually 13.7 billion, but stars didn’t form for the first few hundred million), Dr. Richard Mushotzky of the NASA Goddard Space Flight Center, derived a figure of 1 billion supernovae per year, or 30 supernovae per second in the observable Universe! Could the Milky Way’s red giant star, Betelgeuse be the next? Betelgeuse, one of the brightest stars in the sky, could burst into its supernova phase and become as bright as a full moon — and last for as long as a year. 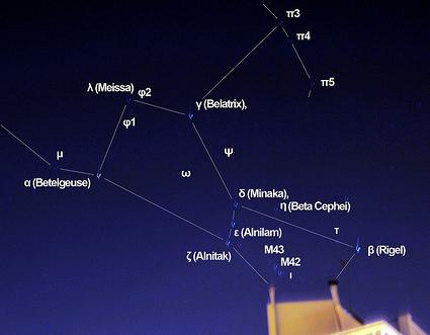 The pink arrow at the star on left labeled α indicates Betelgeuse in Orion. The massive star, visible in the winter sky over most of the world as a bright, reddish star, could explode as a supernova anytime within the next 100,000 years. The red giant Betelgeuse, once so large it would reach out to Jupiter’s orbit if placed in our own solar system, has shrunk by 15 percent over the past decade in a half, although it’s just as bright as it’s ever been. Betelgeuse, whose name derives from Arabic, is easily visible in the constellation Orion. It gave Michael Keaton’s character his name in the movie Beetlejuice and was the home system of Galactic President Zaphod Beeblebrox in The Hitchhiker’s Guide to the Galaxy. If Betelgeuse goes nova, it could offer Earth’s astronomers an up close look at how supernovae evolve and the physics that governs how they work. The problem is that it is not clear when that will happen. While stories have been circulating that the star could explode in 2012, the odds of that are actually quite small. Betelgeuse may explode tomorrow night, or it may not go nova until the year 100,000 A.D. It’s impossible to know. Betelgeuse is beyond the death beam distance — somewhere within 30 light years range — where it could do ultimate damage to Earth. The explosion won’t do the Earth any harm, as a star has to be relatively close — on the order of 25 light years — to do that. Betelgeuse is about 600 light years distant. The super-supernova SN2007bi is an example of a pair-instability breakdown, and that’s like calling an atomic bomb a “plutonium-pressing” device. 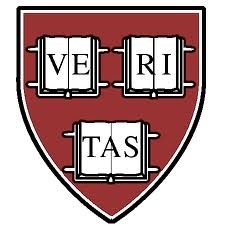 At sizes of around four megayottagrams (that’s thirty-two zeros) giant stars are supported against gravitational collapse by gamma ray pressure. The hotter the core, the higher the energy of these gamma rays — but if they get too energetic, these gamma rays can begin pair production: creating an electron-positron matter-antimatter pair out of pure energy as they pass an atom. Yes, this does mean that the entire stellar core acts as a gigantic particle accelerator. The antimatter annihilates with its opposite, as antimatter is wont to do, but the problem is that the speed of antimatter explosion — which is pretty damn fast — is still a critical delay in the gamma-pressure holding up the star. The outer layers sag in, compressing the core more, raising the temperature, making more energetic gamma rays even more likely to make antimatter, and suddenly the whole star is a runaway nuclear reactor beyond the scale of the imagination. The entire thermonuclear core detonates at once, an atomic warhead that’s not just bigger than the Sun — it’s bigger than the Sun plus the mass of another ten close-by stars. The entire star explodes. No neutron star, no black hole, nothing left behind but an expanding cloud of newly radioactive material and empty space where once was the most massive item you can actually have without ripping space. The explosion alone triggers alchemy on a suprasolar scale, converting stars’ worth of matter into new radioactive elements. Certain rare stars –real killers, type 11 stars — are core-collapse hypernova that generate deadly gamma ray bursts (GRBs). These long burst objects release 1000 times the non-neutrino energy release of an ordinary core-collapse supernova. Concrete proof of the core-collapse GRB model came in 2003. It was made possible in part to a fortuitously “nearby” burst whose location was distributed to astronomers by the Gamma-ray Burst Coordinates Network (GCN). On March 29, 2003, a burst went off close enough that the follow-up observations were decisive in solving the gamma-ray burst mystery. 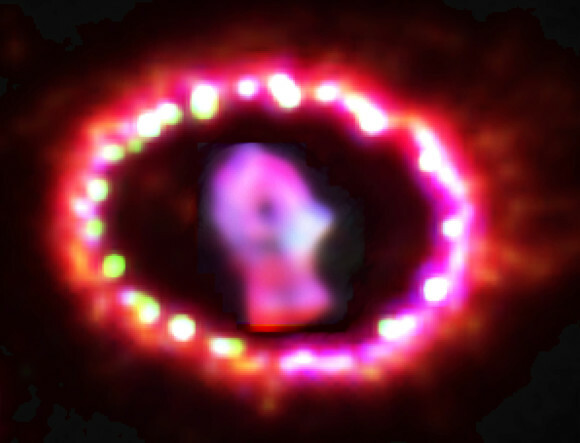 The optical spectrum of the afterglow was nearly identical to that of supernova SN1998bw. 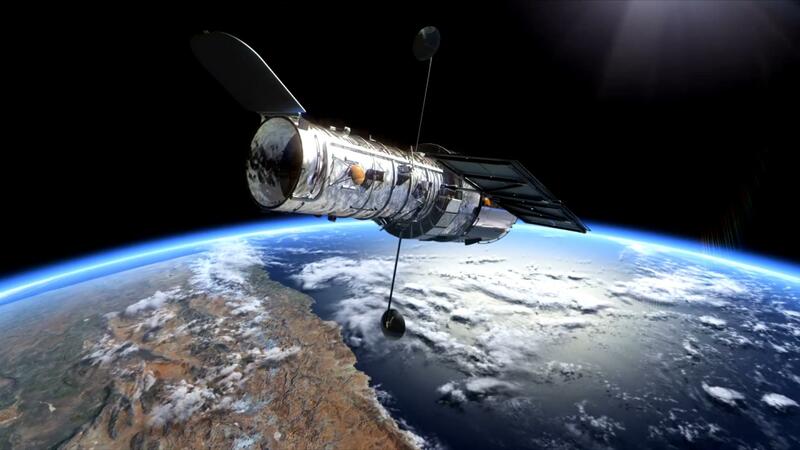 In addition, observations from x-ray satellites showed the same characteristic signature of “shocked” and “heated” oxygen that’s also present in supernovae. Thus, astronomers were able to determine the “afterglow” light of a relatively close gamma-ray burst (located “just” 2 billion light years away) resembled a supernova. It isn’t known if every hypernova is associated with a GRB. However, astronomers estimate only about one out of 100,000 supernovae produce a hypernova. This works out to about one gamma-ray burst per day, which is in fact what is observed. What is almost certain is that the core of the star involved in a given hypernova is massive enough to collapse into a black hole (rather than a neutron star). So every GRB detected is also the “birth cry” of a new black hole. 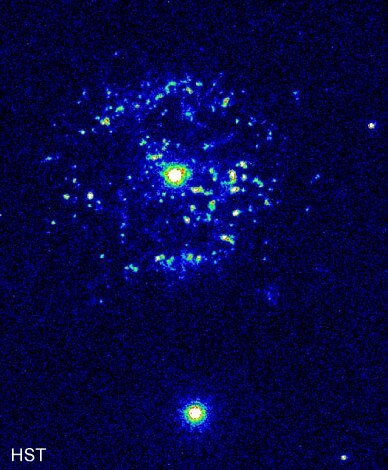 Hubble telescope picture of T Pyxidis, from a compilation of data taken on Feb. 26, 1994, and June 16, Oct. 7, and Nov. 10, 1995, by the Wide Field and Planetary Camera 2 [WFPC2]. Astronomers believe the nova explosions are the result of an increase of mass as the dwarf siphons off hydrogen-rich gases from its stellar companion. When the mass reaches a certain limit a nova is triggered. It is unknown whether there is a net gain or loss of mass during the siphoning/explosion cycle, but if the mass does build up the so-called Chandrasekhar Limit could be reached, and the dwarf would then become a Type 1a supernova. In this event the dwarf would collapse and detonate a massive explosion resulting in its total destruction. This type of supernova releases 10 million times the energy of a nova. Observations of the white dwarf during the nova eruptions suggest its mass is increasing, and pictures from the Hubble telescope of shells of material expelled during the previous explosions support the view. Models estimate the white dwarf’s mass could reach the Chandrasekhar Limit in around 10 million years or less. According to the scientists the supernova would result in gamma radiation with an energy equivalent to 1,000 solar flares simultaneously — enough to threaten Earth by production of nitrous oxides that would damage and perhaps destroy the ozone layer. The supernova would be as bright as all the other stars in the Milky Way put together. One of the astronomers, Dr. Edward Sion, from Villanova University, said the supernova could occur “soon” on the timescales familiar to astronomers and geologists, but this is a long time in the future, in human terms. Astronomers think supernova explosions closer than 100 light years from Earth would be catastrophic, but the effects of events further away are unclear and would depend on how powerful the supernova is. The research team postulate it could be close enough and powerful enough to damage Earth, possibly severely, although other researchers, such as Alex Filippenko at UC Berkeley, who specializes in supernovae, active galaxies, black holes, gamma-ray bursts, and the expansion of the universe, disagree with the calculations and believe the supernova, if it occurred, would be unlikely to damage the planet. Professional astronomers also keep a close eye on the star, as it is notoriously variable: its diameter changes from anywhere between 550 to 920 times the sun’s diameter. In 2013, astronomers said Betelgeuse is likely to crash into a “cosmic wall” of interstellar dust in a few thousand years.